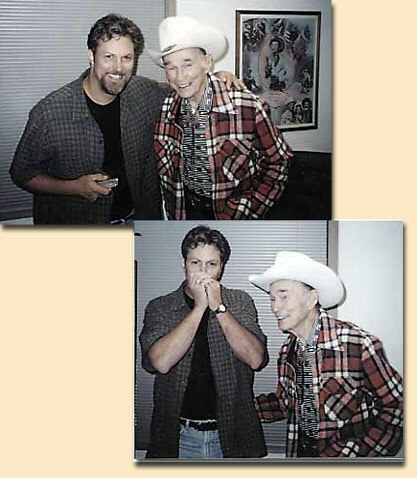 One of TJ's career highlights was an invitation from his pal, Dusty Rogers (Roy Rogers, Jr.), to see the Roy Rogers' museum, meet Roy and perform some harmonica magic for him. "When I got to meet Roy, it was about three or four days before his 86th birthday. The Hohner Harmonica Co. and I got together and gave him an engraved harmonica that reads: "To Roy Rogers, Happy Birthday and Happy Trails to You", TJ Klay and Hohner Inc. When he recognized what I was playing, he came over and put his arm around me and started to sing along. (I about wet my pants!). Because of the engraving process and availability of certain keys it was about 10 weeks before he received it. As a result of the late arrival, it would be the last birthday presents he received, as he rode off into the sunset less than a year later. The harmonica is now on display, along with a harmonica that Roy received from his dad, in the Roy Rogers- Dale Evans Museum located at 15650 Seneca Road, Victorville, CA (tele: 760-243-4548, web site: www.RoyRogers.com). 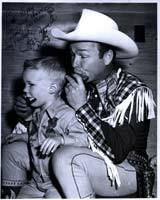 Meeting Roy Rogers provided the inspiration for "Heroes Like You", a tribute to the nation's greatest singing cowboy. "Let your aim be straight and true !!" Autographed and Matted Copies of "Hero's Like You"